Once the stack starts resolving, does it have to resolve completely before someone casts another spell? Surrak Dragonclaw can't be countered. 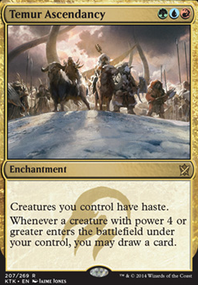 Creatures you control can't be countered. -Good point in re Kiora, Behemoth Beckoner /the 3 CMC clump. 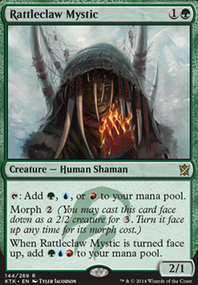 This is primarily the reason, even though I'm considering moving up to the full suite of fetchlands this week (to help make Deathrite Shaman 's mana production more reliable and to maximize the impact of Nesting Dragon , as well as to help be able to cast Dragon Broodmother more reliably/fix mana more or less perfectly), I still can't justify the inclusion of Crucible of Worlds , esp with the more aggressive draw package. -Good point also about Dragonlord Kolaghan being tutorable also w/ Worldly Tutor ; I'll do some more testing and see if my being flooded with haste effects was more a corner case in 2x games. -Agreed about Sarkhan the Mad ; if anything, that gives your build a 1x flex slot. 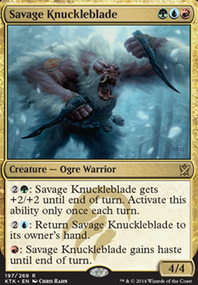 If you're having trouble punching through pillowfort effects but not being punished for a large board state with tons of wipes/spot removal, then he's great; maybe slot in your sideboard Surrak Dragonclaw in control-heavy metas. I might be able to slam about 3-5 more games this week in paper, but aside from some manabase tweaking and adding in one more card (what do you think I'm particularly missing at this point, if indeed I should go back down to 36 lands), hoping to leave this locked for a little bit, especially since War of the Spark didn't give us too many new shiny toys to play around with. Ravnica Allegiance is not looking too exciting apart from Prime Speaker Vannifar , who I will definitely try out in the deck. The cut will likely be Surrak Dragonclaw , but I haven't locked in anything yet. 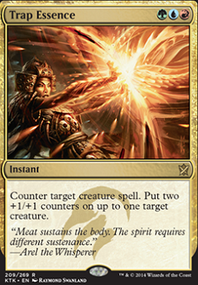 Playing the deck after the cut of Ancestral Statue has proved quite interesting. The deck feels significantly weaker but also somehow more free as all the statue lines no longer demand me to push for a win that way. To take the power level up a notch again I have reverted the cut on one mana dorks I made before Christmas. Maybe considering some mana dorks, they would help speed up your gameplan. Also, Surrak Dragonclaw would be a pretty cool inclusion. 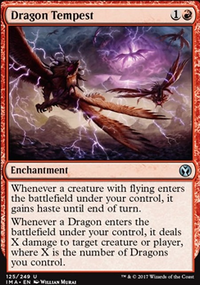 Karrthus, Tyrant of Jund Dragon Tribal. Doran, the Siege Tower Big Butts Tribal. There's some ideas to think about at least. As for what goes in them, that's up to you. These are the most aggro-ey "mess with your stuff if you mess with mine" commanders I could think of. This looks like a really good first draft! There are a few suggestions I'd like to make. First, I'm not sure if Riku is the best commander for this deck. 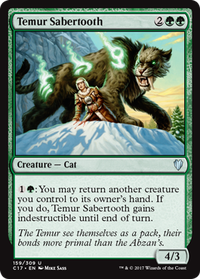 He'll make tokens for all of your creatures, but none of those tokens will get to transform. That having been said, you do have a few cards, like Parallel Evolution and Parallel Lives that play well with him. 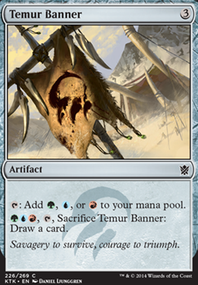 But I think removing the token theme altogether will give you a more streamlined deck. Although you should always run Rite of Replication, imo. 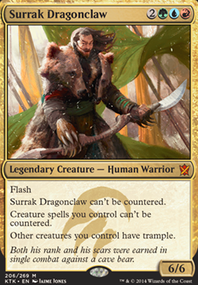 In the spirit of keeping with your Blue/Green/Red colors, I'd recommend Surrak Dragonclaw. 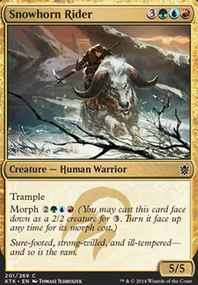 It's most likely you'll want to win games by getting in with creature damage, and giving everything Trample is a great way to make sure you'll be able to connect your swings. Protecting your creatures from counterspells is a nice little bonus. I also think you're running too many lands. You should probably only have between 38-42. 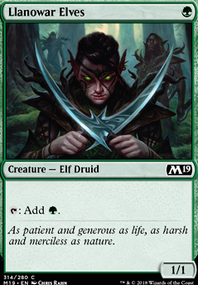 If you're worried about mana problems, run a few ramp spells, like Cultivate and Explosive Vegetation. Werewolves are a small tribe, and don't get as much love as other tribes, but there are a few cards that you could add still. Lambholt Elder Flip, Afflicted Deserter Flip, Scorned Villager Flip, Wolfbitten Captive Flip, and Kessig Forgemaster Flip would all make welcome (not to mention inexpensive) additions. 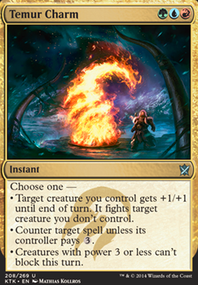 Since you're running Blue, you could also justify putting in a few more clone creatures like Altered Ego. Check out Phantasmal Image, Quicksilver Gargantuan, and, of course, Clone. There are a number of these kinds of creatures you could include if you're willing to look into them. The best part? If they enter as a copy of a transformed werewolf, if something would cause them to flip back to human, they remain in wolf form instead! Also, consider Alpha Brawl. It's very on theme, and, more importantly, it's really funny. 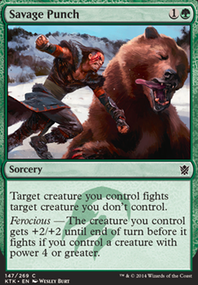 I'd also recommend adding some answers to your opponent's threats to your deck. 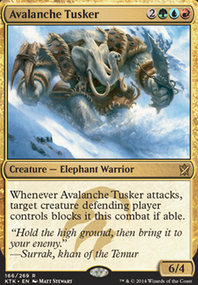 You have a couple of ways of dealing with creatures, but against artifacts, token armies, and decks that rely on fliers, you might have a hard time. 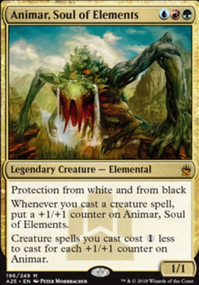 Check out Ancient Grudge, Vandalblast, Beast Within, Cyclonic Rift, and Blasphemous Act as potential answers, or consider other options you might have. Also, this is just a footnote, but I'm not quite sure what Bonus Round does for your deck? It only interacts with seven other cards in your current decklist, and of those, only three are really worth spending the extra mana on. I think it's an easy cut.